Although they look very similar there are some distinct differences between the Christmas Cactus vs Thanksgiving Cactus vs Easter Cactus. Each of these succulents derived their common names from the time of the year that they typically flower in North America. Collectively and even individually they are sometimes referred to as ‘Holiday Cactus’. Later in the article we have posted 5 photographs and a video to help identify these three succulents! All three cacti are epiphytes, growing naturally in trees in the rainforests of Brazil. They have such similar characteristics it is obvious that they are closely related. Both the Christmas Cactus and Thanksgiving Cactus fall under the genus Schlumbergera. The Easter Cactus (sometimes called Whitsun Cactus) is classified under the genus Hatiora. As houseplants, all three require very similar basic care. Why are they so hard to identify? Of the three Holiday Cactus most of the identification confusion is between the Christmas Cactus and the Thanksgiving Cactus. Not only do they look similar, without close examination, but they are mislabeled by sellers possibly more than any other succulents. Intentionally or unintentionally, the Thanksgiving Cactus is often sold as a Christmas Cactus. Since they both bloom in late fall or winter and are beautiful plants, typical consumers are not likely to care exactly which one they have purchased. Nevertheless, it is always beneficial to know, if possible, the exact name of your succulent. This ensures you will be able to provide the best care possible. Christmas Cactus – Has wide and flat segmented leaves that are smaller and rounder than the other two cacti. The edges of the leaves have small indentations (scallops) in contrast to the Thanksgiving Cactus leaves that have outward pointed claws. Put another way, the stem edges are smooth and crenellated (slightly notched) but never toothed or jagged like the Thanksgiving Cactus. The end or tip of each segment is very slightly curved but can look almost flat across. Thanksgiving Cactus – Has broad segmented leaves with serrated (jagged) edges on each side. The serrated edges form into points. There are 2-4 points on each side. (The distinctive claw shaped pointed projections inspired the creative names Crab Claw Cactus or Claw Cactus.) The end of the last segment is slightly concave with a point on each side. Easter Cactus – Has flat segmented leaves that are similar in some ways to the Christmas Cactus. There are slight scallops on the edges of the leaves but the shape is much subtler than the Christmas Cactus. The Christmas Cactus indentations are more tear drop in shape. The Easter Cactus shape is merely slight indentations. The most significant difference are the small bristles on the end of each leaf. There are no bristles on either the Thanksgiving Cactus or the Christmas Cactus. Christmas Cactus – The flowers are usually white or red but occasionally may be yellow. The blooming time is typically in December. The Christmas Cactus has purplish-brown anthers. In contrast the Thanksgiving Cactus has yellow anthers. Flowers are symmetrical being evenly distributed around each flower tube. The flowers are more pendulous and droop straight down from the ovary. Easter Cactus – The flowers are royal purple, red or pink and brighter than Christmas Cactus or Thanksgiving Cactus. The flowers are more star-shaped than the other two ‘Holiday Cactus.’ It typically blooms in the spring months of April and May. Thanksgiving Cactus – The flowers are pink, red, white or yellow and they typically bloom in November. The Thanksgiving Cactus anthers are yellow but they are purplish-brown on the Christmas Cactus. Thanksgiving Cactus flowers are more asymmetrical, protrude from the ovary and extend horizontally from the tips of the stem segments. The symmetrical Christmas Cactus Flower Schlumbergera bridgesii extends down. The Thanksgiving Cactus flower, Schlumbergera truncata, is asymmetrical and grows horizontally. 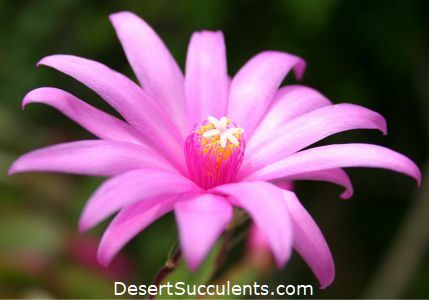 The Easter Cactus flower, Hatiora gaertneri, is a starburst shape. Christmas Cactus – Begins growing upright but as it matures the stems are pendent arching down. Easter Cactus – When comparing mature ‘Holiday Cacti’ the Easter Cactus will be the smaller of the plants. Thanksgiving Cactus – Typically the Thanksgiving Cactus stems grow in an upright or erect direction. The Christmas Cactus stems arch up but then droop farther down. It is usually more difficult to grow the Easter Cactus than the Christmas Cactus or the Thanksgiving Cactus. In particular, the Easter Cactus is much more sensitive to under or over-watering. Many Christmas Cactus and Thanksgiving Cactus will be commercially labeled with the genus Zygocactus. Although that Zygocactus genus name still surfaces it was officially abandoned decades ago in favor of Schlumbergera. 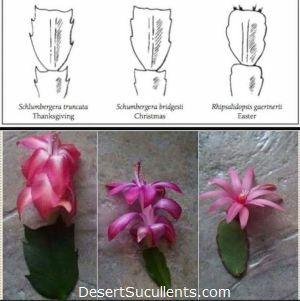 Since the 1950’s both the Christmas Cactus and the Thanksgiving Cactus are technically placed under the genus Schlumbergera. 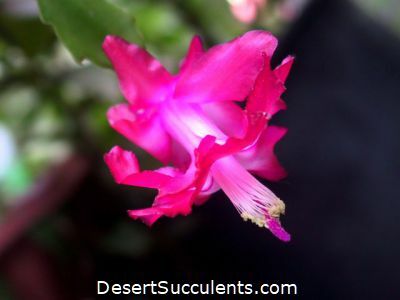 True Christmas Cactus, Schlumbergera bridgesii, is rarely available commercially. The Christmas Cactus is very easy to propagate, however, so it is possible to obtain cuttings from someone that already owns one. 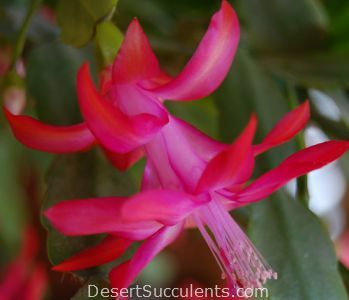 Depending on the care and the growing environment, all three of these ‘Holiday Cactus’ may also produce surprise flowers at other times of the year. Both the Thanksgiving Cactus and the Christmas Cactus will often bloom again between March and May. The Easter Cactus, however, very rarely flowers again outside of its springtime blooming. In fact, it is not uncommon to have years that the Easter Cactus produces no blooms at all. The Easter Cactus is the most difficult to grow. It has the annoying habit of shedding most of its phylloclades at just a slight drought. It also does poorly if it is over-watered. It is almost mandatory to have a soil moisture meter on hand if you want to optimally water an Easter Cactus. It is possible, and maybe even easier, to tell the difference between these three cacti with your eyes closed. Rub your finger along the edge of a leaf segment. If you feel a distinct point or claw it is a Thanksgiving Cactus. If you do not feel a point or claw and you also don’t feel anything on the flat end or tip of the leaf it is a Christmas Cactus. If you do not feel points or claws but you do feel numerous small soft bristles on the tip end of the leaf it is an Easter Cactus. This video is not the best quality but it does accurately show close-ups of the Thanksgiving Cactus, Christmas Cactus and Easter Cactus. The majority of the videos that you find online incorrectly identify these three cacti. Hi guys, it's Lynne here. Hope everyone's having an incredible day. Now in this video I'm going to tell you how you can tell the difference between a Thanksgiving Cactus and a Christmas Cactus and I show the two comparisons between the two. So you know whether you have a real Christmas Cactus or a Thanksgiving one. Now here in Ireland we don't actually celebrate Thanksgiving so most of the Schlumbergera truncate cacti is either sold or sold under Christmas Cactus regardless of their variety. But the reason I'm doing this video is because there are two different types there's a few different hybrids but there's two main different types and they do flower at slightly different times and they do look different. Now the first one I'm going to show you the difference in the leaf arrangements here. Now this one up I hear is the Schlumbergera truncata which is actually the true Thanksgiving Cactus and it has the edges are slightly sharp on the leaf edging and they sort of resemble a little bit like a crab's claw as you can see on here and that is the truth Thanksgiving Cactus. And then the true Christmas Cactus here actually has scalloped edges and this is the Schlumbergera bridgesii I sometimes called bridgesii. There's a few different hybrids but this is the true Christmas Cactus with the round scalloped edging to it. Now just to make a little bit more confusing is that the Easter cacti which are the Rhipsalidopsis [Now changed to Hatiora] [???] family rather thus from [???] family also have scalloped edges and after flower they're do look very similar to the Christmas cacti. I'll just show you this one here this is a Rhipsalidopsis and Easter Cactus. This was given to me as a wonderful cutting by by a lovely friend of mine. It's doing really, really well and this was actually was given to me [??? ]… was a Christmas Cactus because she bought it as a Christmas Cactus but it actually turned out to be an Easter Cactus. An easy mistake to make as I'll show you here that the scalloped edging on this Easter Cactus looks very similar to the true Christmas Cactus. But the differences here although it's got the scalloped edging on this Easter Cactus smooth around scalloped edging. The Christmas Cactus here this Schlumbergera actually has the scalloped edging going downwards in a teardrop shape as you can see that's more teardrop shaped rather than completely rounded and that's how you can tell the difference between the true Christmas Cactus and the Easter Cactus. So just to let you know that in case you buy planted a flower so that's basically the difference with the two leaves how you can tell between the truncata, Thanksgiving Cactus and the bridgesii, Christmas Cactus. And the other difference between the two is obviously the flowers. Now the Thanksgiving Cactus will tend to flower any time from October up until the end of November time. And the flowers always sort of grow sort of outwards and beautiful flowers that they always grow outwards. And with the Christmas Cactus it flowers usually from the November time up until the December sometimes right up until the January a bit later on. And the flowers always hang down almost like beautiful little bells hanging down so that the flowers are different in their arrangements. And that's the - the only way really you can tell the difference obviously the leaf and the flowers and that's really all it is to it, very easy to identify…. …Heaps happiness and tons and tons of cactus power as always from I and until the next video bye. From the University of Illinois Extension – Thanksgiving Cactus, Christmas Cactus, Easter Cactus: What’s the Difference? “These three species of cactus are members of the group of cacti called leaf cacti, explains Martha Smith, University of Illinois Extension horticulture educator. The plant bodies are flattened and the leaves are actually stems. The flowers are produced from notches in these stems or from the tips. The fuchsia-like flowers last a long time. They are usually pink, but modern hybrids include white, red, yellow, and purple varieties. From the Britannica Online – Christmas Cactus “The Christmas cactus is often confused with the Thanksgiving cactus (also called crab cactus, S. truncata, or Epiphyllum truncatum); however, in the former, the margins of the stem joints are crenated (they have rounded indentations), whereas in the latter the margins are sharply saw-toothed.” Side Note: There is a great photo of Christmas Cactus flowers on the Britannica page we have linked to but it is 90 degrees off. If the photo was aligned correctly the flowers would be pendulant (drooping down), not horizontal. As noted, it is not possible to always predict precisely when any of these three plants will bloom. The health of your succulent and the current growing conditions will determine the flowering or lack of it. (1) With succulents like the various Holiday Cactus the “pads” on the stems are sometimes called leaves, cladodes, phylloclades, and cladophylls [link to glossary]. In some ways the stems function and have the appearance a leaf. Technically they are stems but in describing them above it is easier to visualize what they look like by referring to them as leaves. 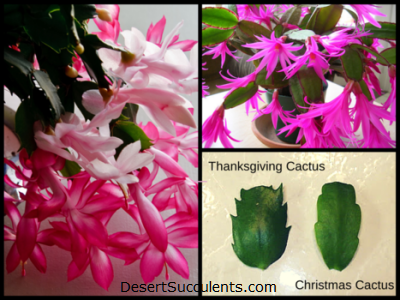 All three of the ‘Holiday Cactus’ are wonderful succulents to add to your collection. Hopefully our article will help you identify whether you have a genuine Easter Cactus, Thanksgiving Cactus or a Christmas Cactus. Since there are many dozens of hybrids that have been developed from each one of these cacti don’t worry if you are still finding it difficult to identifying what you have. Just enjoy your beautiful and unique succulent!